To the beat of a large drum sprinkled with ceremonial tobacco, a dozen members of the Mashpee Wampanoag tribe filed in front of a blanket spread on the carpeted floor, each holding a stick. One by one, they raised the sticks to their lips, moistened them with the tips of their tongues, and placed them in a pile in the center of the blanket in a traditional ceremony called "crossroads." Historically, the ceremony is held to celebrate journeys and express gratitude for good fortune. Yesterday, the Mashpee Wampanoag commemorated and gave thanks for a longawaited and cherished passage of 2007: the federal recognition of the tribe. "It has been a long journey. I am so pleased to be here," said Earl Mills, the tribal leader also known as Chief Flying Eagle, who presided over the ceremony at Harvard's Peabody Museum of Archaeology and Ethnology. The tribal leaders were quick to point out that the ceremony had nothing to do with Thanksgiving Day. "We are not celebrating Thanksgiving," said Shawn Hendricks, president of the tribal council. "It's not one of the better holidays for us. Columbus Day, that's not our top holiday, either." Instead, some tribe members will join other New England Indian tribes today on the waterfront in Plymouth to commemorate the National Day of Mourning, a protest local Native Americans have been holding on Thanksgiving Day since 1970, Hendricks said. He said he will not participate in the protest. During yesterday's ceremony, members of the Mashpee Wampanoag also petitioned for the release of tribal artifacts from collections in Britain. "Your preservation of these documented pieces of our history is essential to our people, and our place in the world," tribal leaders wrote in the petition addressed to Queen Elizabeth II. "Because of this, and the need to properly bury our ancestors, we respectfully request the return of these remains and artifacts." American museums and federal agencies are required by law to return some Native American cultural items at the tribes' request. 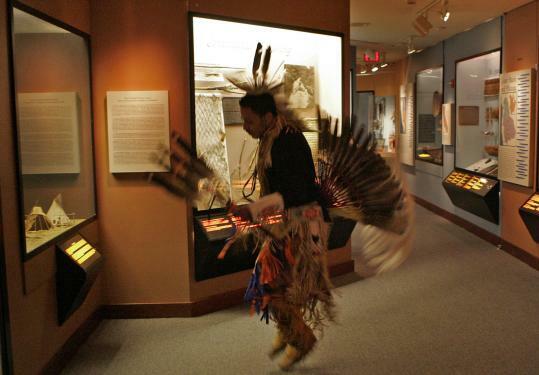 The Peabody Museum, which has 3 million North American Indian artifacts in its collection, has returned some items to the Mashpee Wampanoag tribe in recent years, said Patricia Capone, associate curator at the museum. Most of these objects have been human remains and funerary objects, she said. The tribe is not planning to request that the museum return the remainder of its Mashpee Wampanoag collection anytime soon, Hendricks said. "We have that right to request our things back, but we also need a place to put them," he said, adding that the tribe, which hopes to build a resort-style casino in Middleborough, may build a museum to display its artifacts. "The Peabody Museum is a safer place to keep them for now," he said. For yesterday's event, many tribal members wore traditional Wampanoag regalia made with deerskins and quahog shells, or wampum. Missy Hendricks brought a digital camera to videotape her children, ages 4, 7, 8, and 12, who participated in the ceremony. Cheenulka Pocknett, a tribal drummer and dancer clad in turquoise and green dress adorned with feathers, performed a traditional dance to the fiery drumbeat. Later, Damien Pocknett, Cheenulka's brother, took pictures of Native American artifacts displayed in the entrance hall of the museum using the camera in his cellphone. "Some of this stuff is beautiful," said Pocknett, who also performs at powwows and other traditional ceremonies. "I don't really get a chance to go to museums." Anna Badkhen can be reached at abadkhen@globe.com.